Town Clerk Jo-Ann Raia is pleased to announce that the Huntington Town Clerk’s Archives will join the many organizations across the United States in bringing America’s history to life, by holding an Open House, Monday – Friday from 1:30 pm to 4:00 pm, for the month of October, the only exception being Friday, October 12, 2018. Interested parties can visit the Archives, view the impressive manuscript collection, talk to the staff and learn about the Town’s Records Management Program. Among the many items in the collection is the statue of America’s first hero, Nathan Hale, sculpted by Frederick William MacMonnies, one of America’s prominent sculptors. The Archives is home of one of the three tabletop-sized copies of the Nathan Hale statue that exist in the State of New York. In addition, individuals will have the opportunity to view the new exhibit curated by the Huntington Town Clerk’s Archives, “Lest We Forget Those Who Preserve Life and Property – Honoring the Town of Huntington Fire Departments and First Aid Squads.” The exhibit highlights the history and traditions of our firefighters and emergency personnel over the years. During the opening, we will have on view in the parking lot of Town Hall the oldest vehicle and a new truck owned by each one of the fire departments and aid squads at a date to be determined. On display are images and original artifacts on loan to the Archives from the Huntington Fire Departments and First Aid Squads; a replica model of Northport’s first fire house; and historical and modern day pictures representing all Fire Departments. The exhibition is installed on all three floors of Huntington Town Hall. It will remain open to the public until December 2018, and can be viewed Monday through Thursday 8:30 am – 4:30 pm and on Fridays until 7:00 pm. 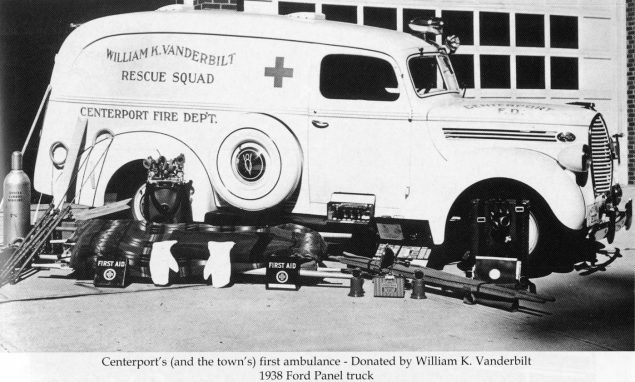 In the photo: The first ambulance in the Town of Huntington, to be displayed at Town Hall during Archives Month.